With over 35 years of experience, our Sacramento tree experts know how best to trim your trees to keep them healthy, safe, and beautiful. Don't let just anyone with a chain saw touch your precious trees. Trust your tree trimming to the trained experts at Destiny Tree Care. 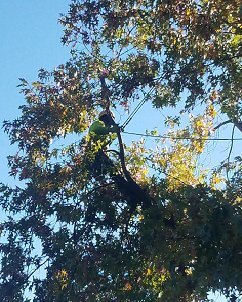 Whether it is a big tree or a small one, we have the personnel and equipment to get the job done properly. And, we promise to leave your yard neat and clean. Have one of our specialists inspect your trees and provide you with tree trimming recommendations. Below we have summarized four different types of tree trimming techniques designed with the health and integrity of your trees in mind. Clean: Selective trimming to remove one or more of the following parts: dead, diseased, broken or hanging branches. Thin: Selective trimming to reduce density of live branches, increasing sunlight and air penetration while reducing wind loads. Raise: Selective trimming to provide vertical clearance above drives, walkways, sidewalks, streets, lawns, homes, etc. Reduce: Selective trimming to decrease height and/or spread, providing clearance from drives, walkways, sidewalks, streets, lawns, homes, etc. It can also reduce wind loads and provide more sunshine to other plants, lawns and gardens. Trimming your trees can serve two purposes; hazard reduction and maintenance. Hazard reduction rids your tree of branches that compromise the structural integrity of the tree. Deadwood is full of decay, fungal organisms and insects and should be trimmed. Maintenance can make your tree more aesthetically pleasing, and also promote better health. You may also be asking yourself, "What is the best time of year to trim your trees?" The answer is actually quite simple! Light trimming to remove small branches can be done at any time. More extensive trimming is best to have done in late winter or early spring, unless you have a sappy tree, like maples or fruit trees. Often it is necessary to trim trees when they are fully leafed out, so you can see where and how much to cut. In addition, most trees can be trimmed at any time of the year. Some exceptions are American Elms and Crabapples which should be trimmed in the winter to prevent the spread of disease. Though Aspen, Silver Maples, Birch and Walnut trees exude sap or "bleed" if trimmed in the later winter or early spring, this will not harm the tree. At Destiny Tree Care, the care of your outdoor beauties is our specialty, one we don't take lightly. We would like to invite you to continue your tour of our website. If you have questions or would like to schedule a consultation, please contact us at 916-370-0687.